Kerry Hotel, Beijing is one of Shangri-La luxury hotels with a more vibrant, energetic feel in every part of the hotel from service to room amenities (e.g. complimentary minibar service upon arrival! yay!). Kerry Beijing is located in the city’s central business district just a short 5-minute walk from Shangri-La China World Summit Wing. The Kerry Beijing is only the second Kerry hotel by Shangri-La Hotels and Resorts – the other one is in Pudong, Shanghai which we will write about in the next few weeks. 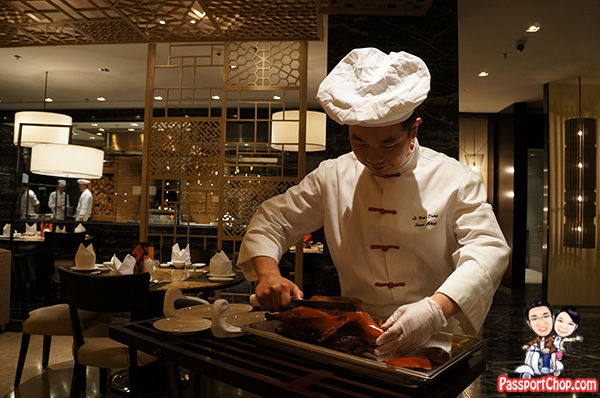 Kerry Hotel, Beijing is also well-known for the Authentic Ya Yuan Peking Duck prepared by Chef Yuan Chaoying at Horizon Restaurant. 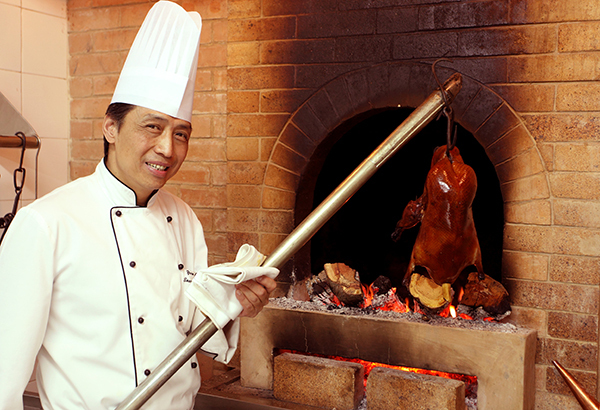 Chef Yuan has spent more than 30 years mastering his signature dish – traditionally prepared wood-fired Beijing Duck (also known as Peking Duck) and has earned recognition for mastering the art of Peking Duck. His specific style of duck, Authentic Ya Yuan Peking Duck, has been enjoyed globally, as Chef Yuan has travelled to many parts of the world, including Germany, Japan, Hong Kong and Philippines to share his masterpiece. He uses the finest quality farmed duck, hung-grilled and roasted over jujube wood to produce a thick, crispy, melt-in-your-mouth experience. 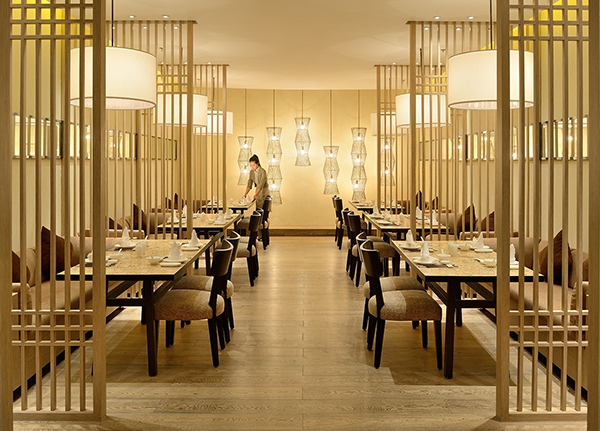 Traditional Chinese elements inspire the Horizon Restaurant’s modern design. Blending elements such as birdcages, lattice screens and bamboo dim sum steam baskets are the main concept used to create the restaurant’s new look. The birdcage theme is reflected in the shadows of the lattice framing of the large customised pendant lamps that create the lighting features around the restaurant. 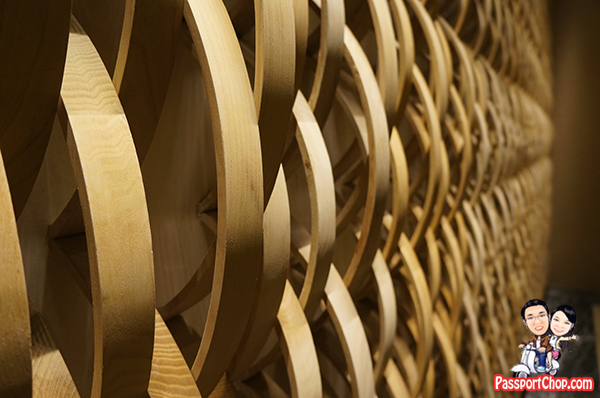 The traditional lattice screen becomes the contemporary partition and ceiling design throughout the restaurant. The warm beige and earth tone color scheme is enhanced by the texture of the paintings. 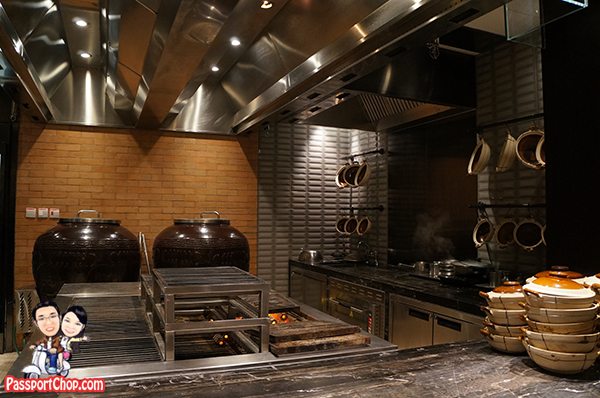 The Horizon Chinese Restaurant also boasts three open theatre kitchens featuring the famous Ya Yuan Peking Duck, Double-boiled Soups and Clay Pot specialties. All of these design elements combine with the three open kitchen concepts to allow for guests to have the ultimate dining experience in the new Horizon Chinese Restaurant. As with most restaurants that serve Peking Duck, the cooked Peking duck at Horizon Restaurant Kerry Beijing (RMB 208 per duck) is carved and sliced in front the diners. The chefs at Horizon Restaurant are quite friendly and are happy to answer your questions about the Peking Duck preparation and will pose with you for photos with the Peking Duck! Do note that you will be required to pre-order your Peking Duck at the Horizon Restaurant. Roasting of the Peking Duck will take approximately 70 minutes. The Peking Duck slices are presented in interesting duck-shaped plates – typically there will be enough slices to fill 2 plates. Our first plate of Peking Duck slices at Horizon Chinese Restaurant comprises the really crispy peking duck skins with thin slices of the meat and these thin crispy really did melt in our mouths – living up to the reputation of the Authentic Ya Yuan Peking Duck. Order the thin slices of steamed Chinese Pancake 春饼 (RMB 12 for 250 grams or RMB 24 for 500 grams) and the combination set of leek/sweet sauce/mashed garlic/sliced cumcumber/white sugar for RMB 6 per set) for the complete Peking Duck dining experience. Spread the sweet sauce, cucumber, leek (and sugar if you like that) evenly on the pancake and place the Peking Duck slices on the pancake and wrap it up – you will get a Peking Duck crepes! Another way to eat the Peking Duck slices is with the Chinese bun (RMB 5 per piece) – it will be like a hamburger (except that the bun is very soft and fluffy). The duck head and the meat around the duck muscle spindle (the part which connects the duck wings to the body) is then served separately. There are only 2 pieces of meat around the duck muscle spindle (as there are only 2 wings) and this is also the strongest part of the duck body so this is typically reserved for VIPs (or guests you are hosting) at the table. 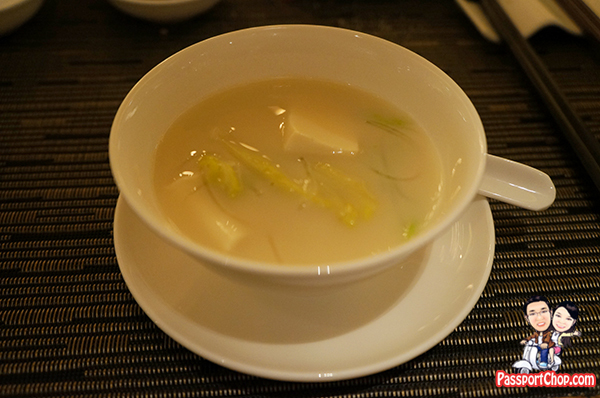 The duck bones may be made into a broth – Duck Bone Soup with Chinese Cabbage, Vermicelli and Bean Curd (RMB 48 per pot). 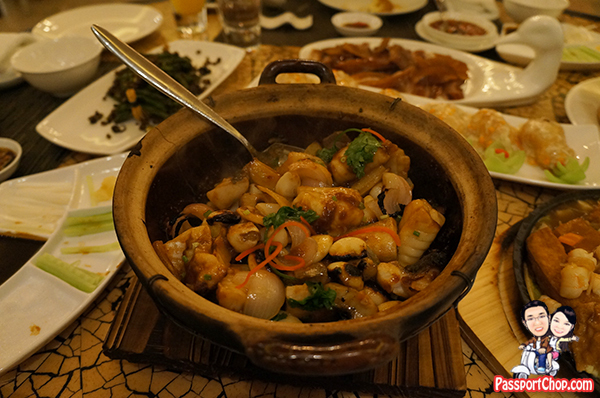 Horizon Restaurant is also well-known for its claypot dishes e.g. 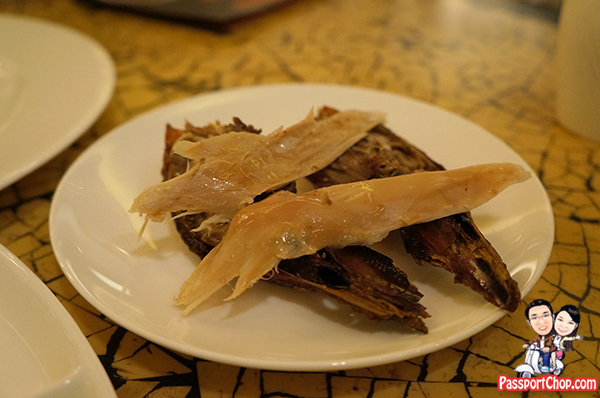 the Chicken with Shallot, Garlic and Onion (RMB 68) shown here in the picture below. What made this dish great was the slight burnt taste and the way the taste of each ingredient was mixed together after simmering in the claypot for quite some time. Another claypot dish that comes highly recommended at Horizon Restaurant is the Chicken and Baby Abalone with Ginger and Garlic (RMB 198). One of Horizon Restaurant’s seafood specialties is the Scallop stuffed with Minced Shrimp Paste on Egg White Custard (RMB 228) – a unique dish with a very soft tofu-like texture and yet incorporates the tastes of scallop and shrimp paste perfectly into one indescribable (and yet yummy) taste (see left picture below). 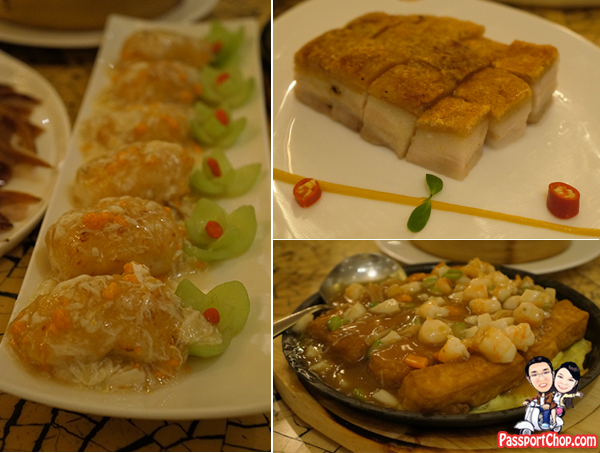 For more familiar zi char dishes that you can find in Singapore, you can try another Chef’s Recommendation – Braised Home Made Bean Curd with Assorted Seafood in Sizzling Pan (RMB 128) and Traditional Sliced Pork Knuckle (RMB 38). The latter dish is an appetiser but be forewarned that it can be very addictive as you indulge in the small pieces of crispy pork knuckle! The Horizon Chinese Restaurant is open daily for lunch from 11:30 a.m. to 2:30 p.m. and dinner from 5:30 p.m. to 10:30 p.m. Besides Horizon Restaurant, guests can also dine at Kerry’s Kitchen. Three live show kitchens, Kerry’s Cold, Kerry’s Grill and Kerry’s Asian, combine passionate kitchen theatrics that are matched in spirit by a team of energetic service staff at Kerry’s Kitchen. Kerry’s Kitchen is all about delivering authentic, well-cooked Asian and International cuisine using the finest quality ingredients. Serving buffet for breakfast and lunch, dinner is purely a la carte with an extensive range of dishes and sharing platters that pair nicely with organic wines, sake, draught beer and other beverage. There is no better way to work off all that calories from the sumptuous meals at Kerry’s Kitchen and Horizon Restaurant than at Kerry Sports. 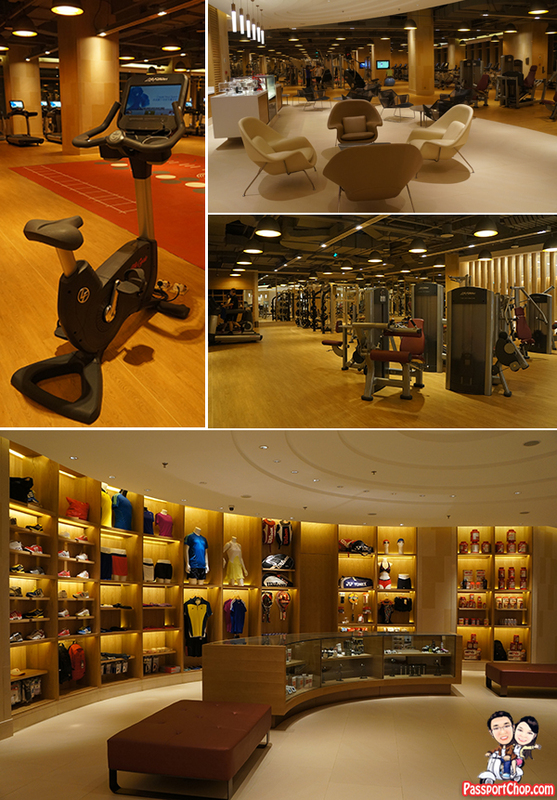 Covering a space of 7,000 square meters and spread out across three levels, Kerry Sports is Beijing’s most comprehensive hotel sporting facility, and a fitness enthusiast’s dream. Operating 24 hours, the gymnasium with over 90 pieces of professional state-of-the-art exercise equipment imported from Life Fitness USA is divided into five areas; Cardio, Free Weight, Personal Training Zone, Functional Zone and the Adventure Racing Zone for maximum comfort and enjoyment. 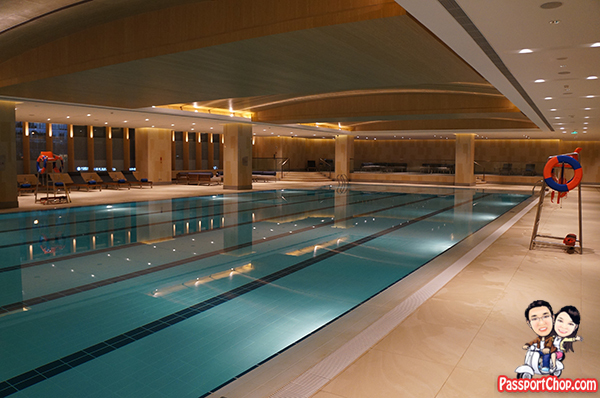 Perfect for cooling off after a sweaty workout at the gymnasium, there is a five-lane world-class 35 meter heated indoor swimming pool and Jacuzzi, as well as children’s heated indoor pool and plunge pool. Unlike the gymnasium which is open 24 hours daily, the swimming pool, jacuzzi and steam room are open daily from 6 am to 11 pm. Just when you thought it can’t get anymore amazing as what you see in the current Kerry Sports, we were surprised to hear that these developments are only Phase One of Kerry Sports development. In the Fall of 2013, Phase Two of Kerry Sports will open. Phase Two will have space for some fancy footwork, there will be a multi-function court with rebound impact multi-layer surfaced floor that converts into a NBA-compliant full-size basketball court or four badminton courts. Also, on the second floor guests will find the Adventure Zone. This kid powered space is being designed to be the ultimate indoor retreat where kids rule the space! We tried the Adventure Zone at Kerry Pudong and it is truly amazing and a space that every kid would love to play in. Last but not least, the top floor of the complex will be a 220 meter-long outdoor running track complete with protective surface matting, making it ideal for joggers to get away from car exhaust and dangers of exercising in traffic. The Horizon Restaurant and Kerry Sports are located in Kerry Hotel, Beijing (No 1 Guanghua Road, Beijing, 100020, China). Kerry Hotel, Beijing, is just 30 minutes from Beijing Capital International Airport, and is located in the heart of the Central Business District. The hotel sits on Beijing’s Third Ring Road.